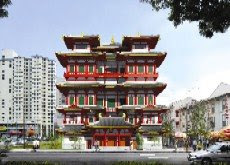 Singapore is a multi-religious country due to its diverse ethnic mix of peoples originating from various countries. Most of the key religious denominations are represented in Singapore and religious tolerance is promoted by the government. The largest religion is Buddhism, with 42.5% of the resident population declaring themselves as adherents at the last census. Most, but not all, Malays are adherents of Islam with a substantial community of Indian Muslims. Below are some statistics on the diversity and spread of religious faiths, which as a westerner coming from a country where Christianity is the majority, I found it quite strange not to be taking a public holiday for Easter Monday or Boxing Day (day after Xmas) - after having done so every year of my life. However, the number of vacation days in Singapore dedicated to religous faiths far outnumber those celebrated in Australia. Monday, 19th May 2008 is a public holiday for all of Singapore and Malaysia, for the celebration of 'Vesak Day', a Buddhist celebration which I will elaborate more upon after stating the following statistics. Most Singaporeans celebrate the major festivals associated with their respective religions. The variety of religions is a direct reflection of the diversity of races living there. The Chinese are predominantly followers of Buddhism and Taoism with some exceptional agnostics. Malays are mostly Muslims and Indians are mostly Hindus but with significant numbers of Muslims and Sikhs from the Indian ethnic groups. Religion is still an integral part of cosmopolitan Singapore. Many of its most interesting buildings are religious, be it old temples, modern churches, or exotic mosques. An understanding of these buildings do play a part in contributing to appreciation of their art. Taoist, Confucianist, and Buddhist figures together with ancestral worship are combined into a versatile mix in Chinese tradition temples. In fact, these three religions had exerted their influences over Chinese cultures and traditions since ancient times. It is sometimes difficult to tell them apart when examining the Chinese heritage. The most important event in the year for the Buddhist community in Singapore, is the observance of Vesak which commemorates the birth, Enlightenment and Final Nirvana of the Buddha. Vesak falls on the full moon day of the fifth month of the year. 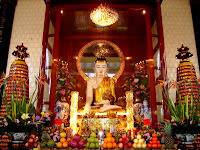 This occasion is observed by millions of Buddhists throughout the world. For some Buddhists, the observance of Vesak begins early in the morning when they assemble at the temple to observe the Eight Precepts. Others may join the communal observance later by going through the ceremony of taking the Threefold Refuge, observing the Five Precepts, making offerings at the shrine and by chanting and recitation. 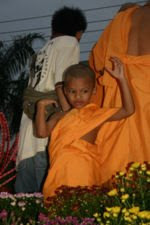 They may also participate in processions and circumambulation , and listen to discourses on the Dharma. In some temples, Buddhists take part in the ceremonial bathing of the statue of baby Prince Siddharatha. 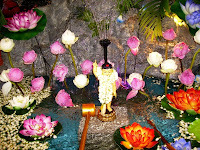 A small standing statue of the prince is placed in a basin of perfumed water strewn with flowers. The Buddhists scoop the perfumed water with a ladle and pour it over the statue. This act of bathing symbolises the purification of one’s unwholesome actions. On Vesak Day, some Buddhists release captive animals such as birds and turtles. This act of kindness recalls the Buddha’s teaching of universal compassion. Many Buddhist also take vegetarian meals on this day. The temples are often colourfully decorated with Buddhist flags and lights. 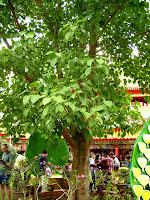 The shrines are also filled with flowers, fruit and other offerings brought by Buddhists. Vegetarian meals are often provided for all those present on this occasion. "Traditionally, Buddha's Birthday is known as Vesak or Visakah Puja (Buddha's Birthday Celebrations). Vesak is the major Buddhist festival of the year as it celebrates the birth, enlightenment and death of the Buddha on the one day, the first full moon day in May, except in a leap year when the festival is held in June. This celebration is called Vesak being the name of the month in the Indian calendar. " His clear and profound teachings on the cultivation of heedfulness otherwise known as Satipatthana or the Four Foundations of Mindfulness, is the path for the purification of beings - for the overcoming of sorrows and lamentation, for the destruction of all mental and physical sufferings, for the attainment of insight and knowledge and for the realisation of Nibbana. This has been verified by his disciples. It is therefore a path, a technique which may be verified by all irrespective of caste, colour or creed. Click the thumbnails for large size view - credit for these pictures to "KosongKosong"! Picture 2: "Sleeping Buddha - Metta" - Peace and Harmony. Do Good. Cease From Evil.Purify The Mind. Walk the Middle Path, avoiding all extremes - always mindful of the eight doors of the physical and sensual worlds. May All Living Things Be Well and Happy. May They Be Free From Pain,Anguish and Suffering. Picture 3: "Bathing of the Statue of Baby Prince Siddharatha"
This is a big day for many countries. Not many buddhists from China mainland celebrate it. The governement will not allow religious holidays of any kind in China.